Core at CCAFS, located at 28.491781, -80.582790. A booster just left Hawthorne, it was staged at one of SpaceX's nearby lots for a couple hours. Presumably B1054 unless another core has shipped to McGregor since September 17th. A booster just left Hawthorne, it was staged at one of SpaceX's nearby lots for a couple hours. Presumably B1053 unless another core has shipped to McGregor since September 17th. B1053? Shouldn't this be B1054? B1053 was in the final assembly line slot (i.e. the end of the line) at the BFR event on Sept 17th. It's possible that 53 already shipped to TX or that it was moved back in line, but moving boosters around on the factory floor is a massive work disruption and the last booster spotted coming from TX was likely B1050. I'm confused, I thought the booster behind Elon was B1054. Entirely my mistake  It was indeed 1054. Don't recall this recent NASA photo being discussed (found somewhere on NSF). Anything interesting in the back ground? 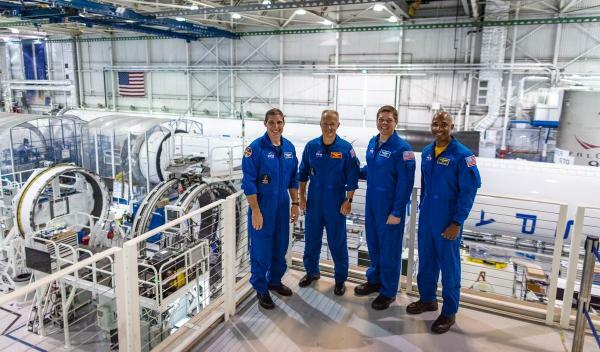 On the right in the background, the used interstage that was installed on the "mystery booster" at the BFR event. It says "Booster 570". 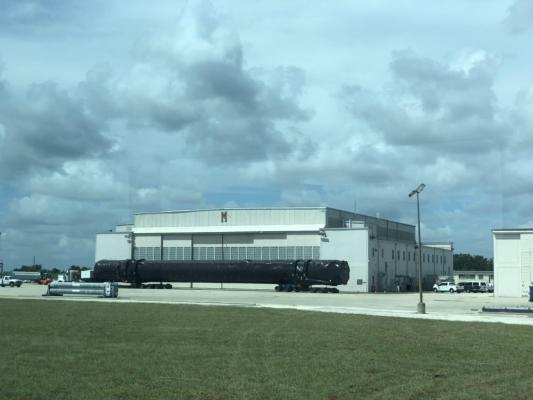 B1053 is on the center in the background ready to be transported out of the factory and B1054 is on the left before being moved to where B1053 is in that picture and then it was later seen in that position on the BFR event. I guess this picture was taken around mid or late August. This transport is close to the Nov 1st prediction for core 1056, but the missing engines is puzzling.. This is not B1056, you have to take into account that B1051 took a slot at McGregor's schedule of boosters for re-testing after B1054 passed testing, so this must be B1055, the mystery booster. Make sure to shift your schedule of cores accordingly, this has happened before and once this happens it is a mess to keep track of the boosters, one doesn't know which one is gonna appear next. SSO-A booster arrived yesterday at Vandenberg. This looks like more and more that SSO-A booster might be B1046 instead of B1048. Assuming this is heading towards McGregor*, it might be because the remaining engines are waiting for it at McGregor. It would be possible to invent all sorts of reasons for that, eg. * if it's actually heading west, it could be a pre-flown core which has had four engines removed for whatever reason. Is there any public info on 1054 having finished testing? I might have missed it. I agree it is almost impossible to keep track as no new cores are being flown, so now 5 cores unseen after travelling to McGregor of which some not even seen travelling there..
With 1051 just tested (again?) does not say anything about other cores. It clearly got special treatment. Might be a queue of untested cores for all we know. Not a problem, not needed for some time still..
For some reason no info whatsoever is being shared from inside, unfortunately. Do all cores after 1051 have the new COPVs? Or is 1051 unique for now? Falcon 9 spotted in Louisiana with what appears to be some missing engines. Likely the same one that was spotted in Arizona. Maybe B1048 heading east since it bypassed McGregor? It looks like the normal 9, plus more added behind those (just for transport, presumably). Edit: never mind, the trailer is different than the other pics I looked at. I was basing that on the overhang distance which varies between trailer layouts.